ZEISS precision eyeglass lenses and i.Scription® enhance your vision and your life! For over 160 years, ZEISS has been the world's leading brand in precision optics. Like NASA, Google Earth, Nobel prize winners and Hollywood producers, you can enjoy the quality offered by ZEISS, the pioneers in precision optics. ZEISS introduces a new lens concept for better vision: enjoy clearer and high contrast vision at night and in low night. Improved night vision has become a reality for people who have chosen ZEISS customized lenses featuring i.Scription technology. i.Scription® by ZEISS is a technology developed by the leader in eyeglass lenses that analyzes the individual profile of each eye and uses this information in the computation and production of the eyeglass lenses. For the wearer, this can mean an entirely new quality of vision, especially at night. People who wear these lenses experience much clearer and sharper vision at night & also perceive contrasts and colors more intensely. Bright light sources against a dark nighttime background can create visual problems: light cones, reflections, mirror images, limited vision, low contrasts and overall adverse visual conditions that irritate and fatigue the eyes and the overall sensory system. Consequently, the risk of having a traffic accident is at its highest level at night. These factors not only increase the risk of accidents, they also have a negative impact on the quality of life of the people who have to live with them. They may have a difficult time driving at night at all, and even be unable to enjoy night time outdoor activities. Every eye is as unique as every human fingerprint. A new patented procedure developed by ZEISS - i.Scription - takes this individuality into account. In addition to the typical vision conditions, i.e. 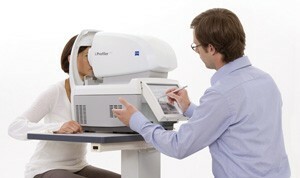 near- or far sightedness, an examination with i.Profiler plus by ZEISS also analyzes the individual eye profile. Every person's profile is unique. During the examination process more than 2,500 reference points are measured, though the examination only requires the patient to look briefly into the device. It is a high-tech solution for the eye: harnessing the powers of infrared light, i.Profilerplus® by ZEISS generates a light point on the retina. As it is reflected back to the i.Profilerplus®, the light is distorted by the eye's individual aberrations. i.Profilerplus® measures these aberrations to create a custom profile for every eye. 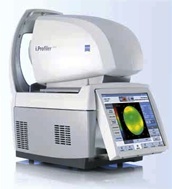 i.ProfilerPlus is an instrument designed to determine the exact "fingerprint" of your eyes. This makes it possible for your Doctor to create ZEISS customized lenses with i.Scription to deliver your best vision possible.